If you live in/near or are visiting Brighton, then one of the places you must visit is the Sea Life Centre. The centre is situated right on the seafront, by the pier so you can’t miss it. Although there are a lot of steps down to the entrance, if you head down to the beach there is a tunnel. This is ideal if you have a wheelchair or a pushchair. 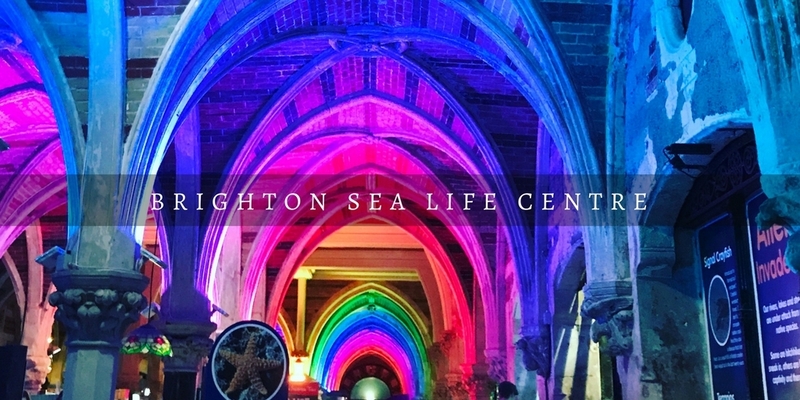 The Brighton Sea Life Centre is actually the oldest operating aquarium in the world. It was built-in 1872 and features 3,500 creatures including a sea turtle and magnificent sharks. It is a stunning building, full of Victorian architecture. It’s a really good aquarium for kids, as it’s not too big but also not too small. They also stamp your hand on entry which means you are free to come and go through out the day. So if you were planning a whole day out in Brighton you could pop in, go out and get lunch, then go back in. There is plenty to look at and experience. You can take a tour behind the scenes or a trip on a glass bottom boat in the main tank. They also have several talks/sessions on throughout the day. In the main hall they have a touching pool where you can touch starfish and sea anemones. The staff are always around to answer any questions you might have. I have to say the glass tunnel is really nice to walk through. There are sharks, a sea turtle, a massive ray and many fish. Clem loves it as the sharks swim over head and she likes spotting the turtle. During the holidays they usually have different events running which you can find out on their site. We recently went and met a member of The Octonauts, and they now have a Jurassic Seas event on. You can dig for fossils and do fossil rubbings in the craft area. My favourite part of the aquarium is probably the tropical part. The tanks are so clean and bright, full of colourful fish including lots of nemos and dorys, which Clem loves. They also have a little tunnel which children can go in and spot the fish. I tried to get through and almost got stuck! It’s also nice to see they have a whole section on sustainability and how we can help to care for our seas. My top tip if you are planning on visiting the sea life centre is to book in advance, the prices are cheaper. If you are local to Brighton they also do a local pass which is valid for a year. You can also get discounts on various local businesses as well as the gift shop if you have one of these. Due to its location right on the seafront it means you can wander along the beach, pier or into town if you have time to spare. Have you been to the Sea Life Centre in Brighton? If you have I would love to know if your little ones are as obsessed with it as Clem is.